These are challenging financial times to say the least, but it doesn’t change the fact that if you are in a relationship with someone whom you really care about, you want to do something nice together on Valentine’s Day. 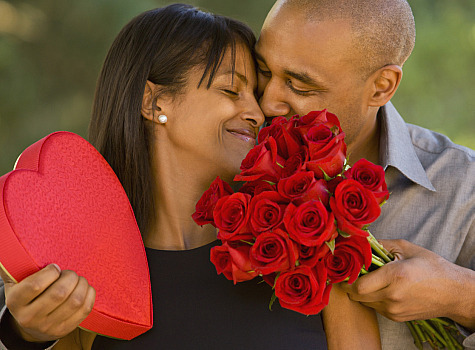 So, here are some ideas for those who are on a budget to have a great Valentine’s Day experience! Cater to your significant other’s guilty pleasures. Guys, if your lady enjoys a tabloid, kettle corn and a Sprite, make her a gift basket with her favorites. Ladies, if your man gets a kick out of watching old-school “professional” wrestling, buy him some Legends of Wrestling DVDs that feature Jimmy “Superfly” Snuka, Junkyard Dog, and Andre The Giant. Guys, if it doesn’t interfere with your own job, skip the florist and show up at her job yourself with a few of her favorite flowers and/or take her to lunch. Perhaps your mate is a big coffee or tea drinker. If it fits into your budget, he or she will enjoy the Keurig! Ladies, treat him to the new action movie he’s been waiting to see. Guys if you’re a beast in the kitchen, let your inner Emeril shine, put your culinary skills to work and fix your lady a meal she’ll never forget! If your mate is really into chocolates and other Valentine’s Day related candy, wait a day or two after when it will be discounted! If you don’t have extra money to spend this year, relax and enjoy each other’s company. Watch your favorite movie together or check out free things to do in your area like the museum. Create a coupon book for your significant other that includes things that you will do for him/her like a coupon to treat him to a local sporting event or to treat her to a mani/pedi. Speaking of coupons, don’t forget to check out coupon sites like www.groupon.com or www.livingsocial.com! Everyone’s budget varies, so have fun and be as creative as possible! Happy Valentine’s Day! Amber Thompson is a freelance writer living in Hampton Roads, Virginia. After giving her life to Jesus Christ over 12 years ago, Amber obeyed the urging of the Holy Spirit to serve others who are in need. Amber often meets and encourages single adults to make smart personal decisions that will lead not only to wise relationship choices, but also improve the overall quality of their lives.